I did 20% of the swimming distance in front crawl and 80% breaststroke - exactly oppose of what I have planned. 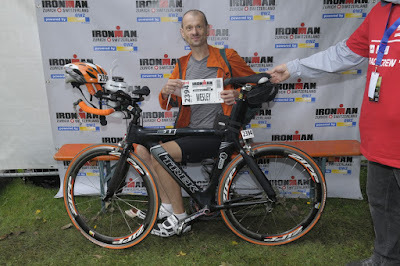 It didn't cross my mind then that one day I will attempt to do the Ironman race. 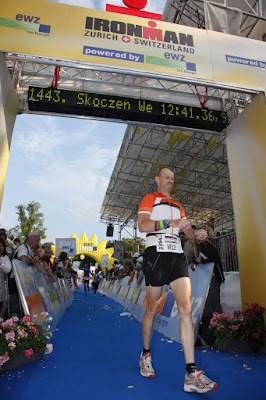 I felt of my bike four weeks before the race, and while the pain in the rib cage area was affecting my taper swim and run I was almost fully recovered on the race day, and that incident didn't have a lot of influence on my final result. I wasn't afraid of hills, I had a week of climb training in Blue Mountains in June and I did test ride on the 10 km loop including the Heartbreak Hill on Thursday. This hill was steep but short, I made it easy to the top gaining confidence. Water temperature was on the verge of wetsuit limit, I did my 1 km training swim on Thursday without wetsuit and was pleasantly surprised that it was so easy. I was ready for swim even without wetsuit despite the fact that bulk of my swim training was done with a pull buoy. Bikes were checked the night before the race. Photos were made for security reasons; After the race picture taken was compared when athletes were leaving transition area. For the first time in my racing history I couldn't sleep the night before the race due to pre-race excitment, luckily I arrived in Switzerland on Wednesday and had 3 nights of good sleep before. "The Ironman run course is littered with fit dudes walking and talking about what a great bike split they had. Don't join them." 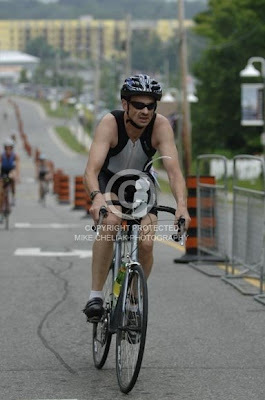 I was the dude who has the great bike in Muskoka, but I was walking a lot on the run course. 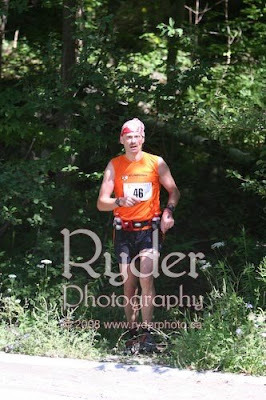 My major goal for this race was to not walk on the run and to finish below 12 hours. It was a mass start of 2000+ triathletes. The announcer asked to enter the water and wait for the start signal, but as soon as the first few rows entered the water the swim started; while still on the beach I saw first swimmers 500 meters ahead. It was chaotic on the entry and for the first kilometer. I passed a lot of swimmers drafting from one swimmer, passing and drafting from another in front, multiple times for most of the first loop. On the second loop I had some moments when drafting was not available, but the course was still crowded. I have finished swimming slightly ahead of planned time and I wasn't tired at all. Front crawl only this time. 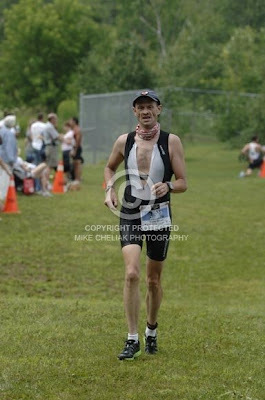 My transition time included change of shorts (last minute decision to use bike instead of tri shorts). No name 8-9 km uphill starting at 30 km was difficult, but not steep, the Beast was tough, but it was much more difficult to climb on tired legs the hill to the village Fusch. 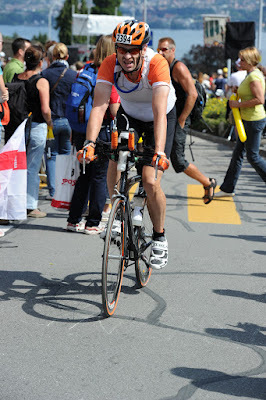 I realized after that uphill that I am very poor descender. Almost everybody was passing me on this downhill. I was surprised and scared. I never had to slow on downhills in Ontario but my hands were in pain hard squeezing brakes on this downhill. Most of the action with Tour de France like crowd happens on the Heartbreak Hill. While it is relatively short, it is steep and what was easy when I did it as a part of 10 km loop on Thursday before the race, it wasn't easy after 80 km of pedaling. It wouldn't be very difficult course if it was just the one loop; I didn't push hard on uphills as I was trying to do relatively conservative bike split, but even without pushing near the end of the climb to the Fusch I questioned myself if I will be able to ride the Heartbreak Hill after it or will I walk it? This time on the approach to the descend ambulance on signal passed me going obviously to help somebody who crashed. I was scared and slow on this hill even more than the first time. I was able to ride the Heartbreak Hill - spirit of the surrounding crowd was priceless - it was even easier than on the first loop knowing that cycling is almost done. There is 10+ km loop to repeat 4 times. My planned pace for the run was 6:20 min/km which would be 4 hours 27 minutes marathon time. I felt great after the bike, and started way to fast 5:37, 5:41, 5:51. I didn't realize yet after 3 km that in the heat of the day it was to fast. At 5 km, waiting in line to the washroom and sweating like crazy I noticed that it is hot out there. I slowed my pace after that, to 6:20 and than after 11 km I slowed again - this time it wasn't conscious decision but rather the effect of exhaustion. 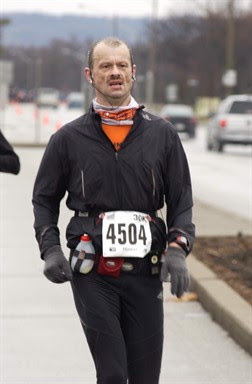 I fought hard to keep 6:20 pace, but had no strength, went over 7:00 min km on km 19 had it back to 6:40 at 20, but I didn't have much left in me at this moment. I was walking a lot during the 3rd loop. The sun was much lower at this point and clouds were moving in. I returned to the rhythm of running on the 4th loop, but it wasn't fast, at times fast walkers were passing me I put all I had to run this loop continuously, and I did with exception of aid stations. I even passed a few people in the final 2-3 km with the finish so close. I was glad it was over but I was proud that I accomplished it. 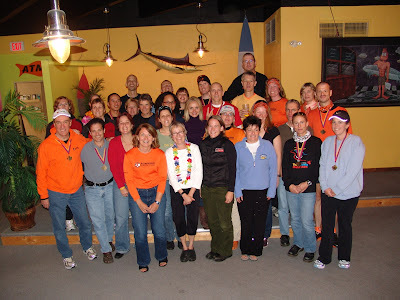 It is a huge jump from my first triathlon no so long ago. I suffered a little bit but overall I wasn't totally exhausted. 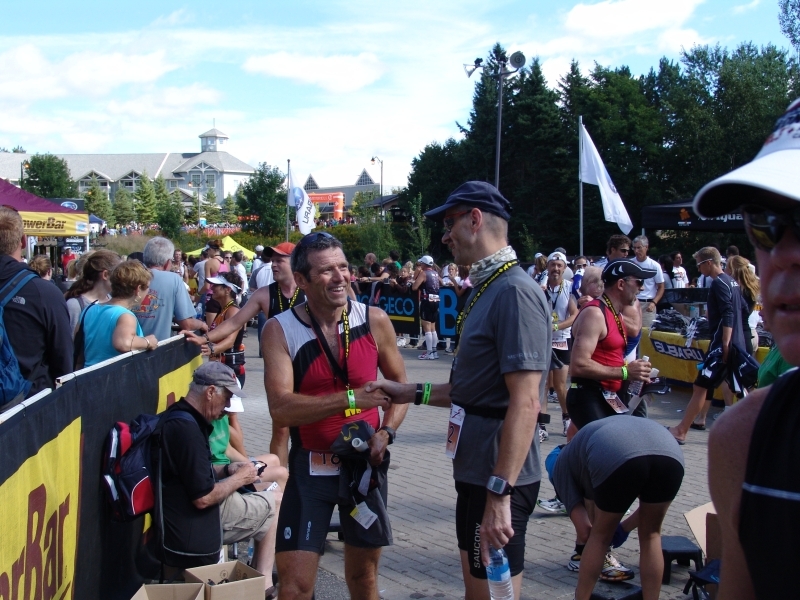 The Ironman race is tough no doubt about it, whats more important it takes time and discipline to prepare for one and that part is much more difficult. As for my goals to not walk on the run and to finish under 12 hours... 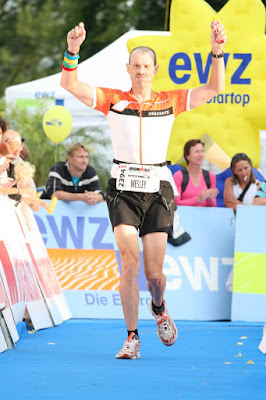 I will do another Ironman, not next year, maybe in 2-3 years. 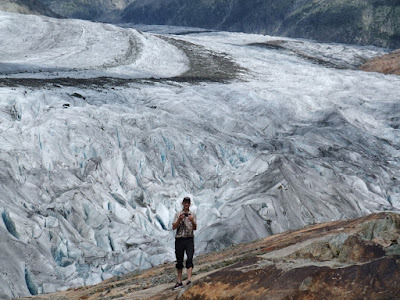 and than trips to Zermatt, Milano, Lousanne, Mountreaux... 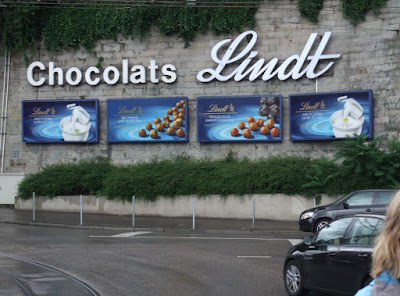 It was a great trip overall...I ate to much chocolate.. Exhausted and painful but happy and and now almost relaxed. It was great event, in stunning location, great organization and wonderful volunteers. I liked both training and racing there. 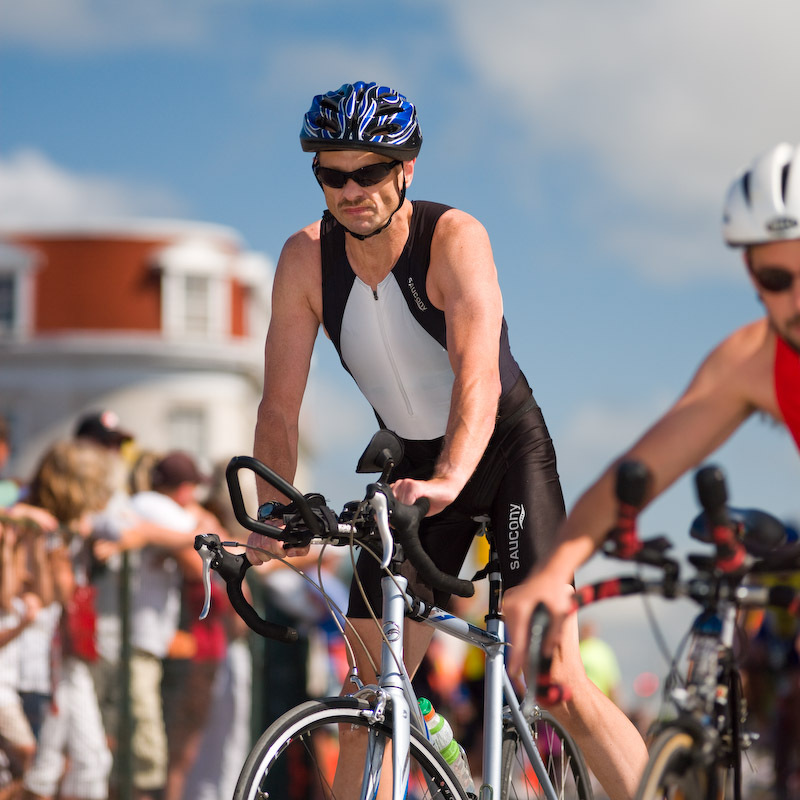 There are three main components of triathlon: swimming, cycling, running; for the longer distance the fourth component is nutrition and the fifth is mental. I thought that I covered well first three components by a consistent training. I struggled early this year, mainly with biking due to busy work schedule, but had a very nice training summer and overall I was happy with my overall fitness in all three sports. I had my nutrition plan developed and tested just before the race, During the bike part I did the important pre-load for the run with some gels and infinit from wearable water holder. I used an aerobar bottle for the water - I didn't need to slow down at all on the bike. I had some doubts earlier this week due to cold but by Sunday morning all cold symptoms were gone. It will came later in this report that there are two important elements of triathlon I wasn't thinking about: emotions and experience. When I train alone be it swim or bike or run I always try to compete, sometimes against unsuspecting walking pedestrian on my long runs, sometimes with a person in the other pool line...This is my nature and this is why I like to race. I was planning this race for months, on 15 of August I did a full course ride, I divided the course into four sections (35km, 25km, 25km, 9 km) and did this race simulation at average above 30 km/h (30, 31, 31,29). My average speed went down to 29 km/h. I knew that it will be tough in the last 9 km section. I was afraid that my legs will give up on uphills and I will have to walk. I somehow survived this section with avg speed 29 km/h, for the total bike average of above 32 km/h. I was happy that it ended. I saved some time. I didn't know at this moment if it will have any impact on my run. I had some back and thighs pain and trouble sitting down to change shoes and pick up gear. 5 minutes included a pee break. I haven't done a lot of bricks, but my bricks were strong in training. I was usually averaging 5:00 min/km in the first few km after the long bike rides. The first two km are uphill I did that part in 5:40 min/km and felt some discomfort in my thighs, but after I hit relatively flat Highway 60, my legs refused to cooperate. I knew at this point that I overdone it on the bike, it was hurting. I new that now it is a race to survive. I walk part of km #3. I started to go above 6:00 min/km and whenever I managed to go below 6:00 min/km my legs refused to cooperate. I struggled to the end of race walking all water stations. Before the turn back I saw Mark (1Ironatatime) going back and looking strong, I did quick calculation and I knew that he will have a strong race - I was happy for him. Shortly after the turn around I saw Joe, a friend from the pool. 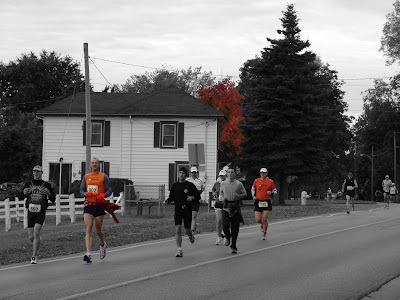 He competes in different age category (55+), but is a way stronger runner. I beat him at Guelph Olympic by 1 second. He was approximately 10 minutes behind me now, I wanted to finish before him, knowing that he would be gaining probably 1 minute per km. I couldn't change my pace but knowing that Joe is behind I made my walk brakes as short as possible. I arrived to the finish earlier, but Joe beat me by two minutes, because he started in later wave. 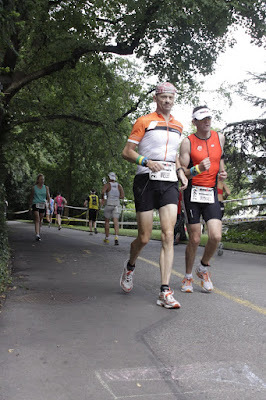 True is I lost the race with Joe in Transitions - my total time +13 minutes , his only 8min and 11 seconds. Finished the run in 2 hours and 8 minutes. 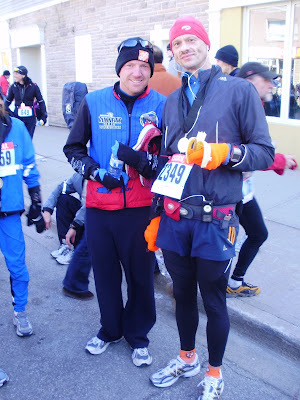 Total time 05:51:58, not that far from my plans but resulting in a lot of pain. 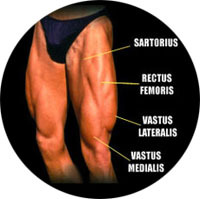 My legs and back are still hurting today. 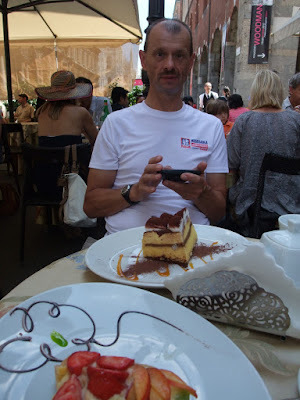 I am an old person but relatively new to triathlons, I let my emotions take over well calculated plan. 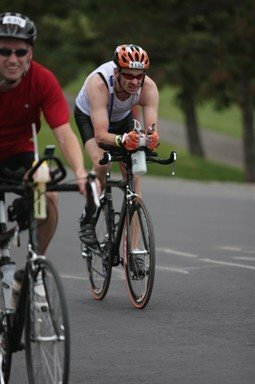 I made a few mistakes in my previous triathlons I never suffered because of it, until now... I somehow finished this race but it was tough. It would be impossible to finish a full Ironman in such a manner. If you asked me on Monday after the race if I would register for a full Ironman I would say not, but it would be to late. 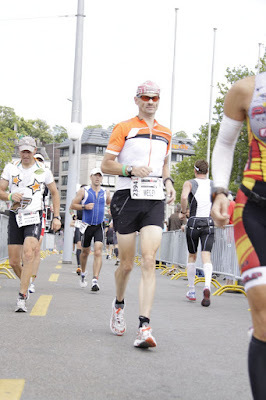 I have already registered a month ago for Ironman Switzerland in 2010. 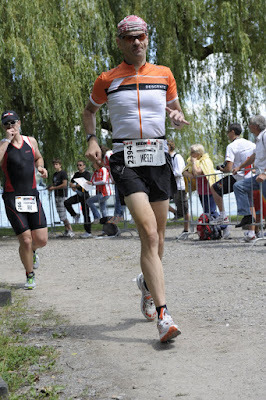 I participated in the Long Course Triathlon in Kingston on 03 of August. 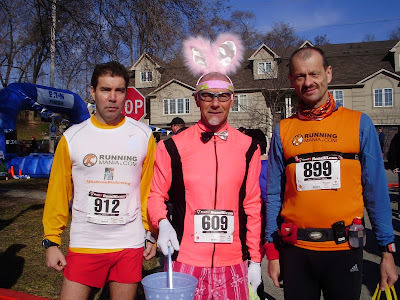 The full report is posted on Running Mania forum. Here some highlights. 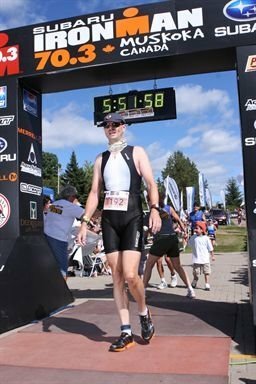 In June of last year i did my first triathlon. It was 750 meters swim followed by 19 km bike ride and 5 km run. The weakest part of my tri debut was swim. I was planning to do 50m/50m breaststroke/front crawl splits. It didn't work well. I did 80% of my swim in the breaststroke. My position in swimming wasn't bad (my breaststroke is fast) but I wasn't to happy about that swimming performance. This year was different I went to Kingston for Long Distance Triathlon, which is 2000 meters swim, followed by 56 km bike ride and 15 km run. I started swim training early January of this year. I have learnt a new technique of front crawl called Total Immersion. I was training 3 times a week swimming approximately 190 km in 180 hours since January to the date of the race. I was going to this race confident that I can easy get through this swim in front crawl only. I have finished the swim relaxed, feeling that I could easy swim another 2 km without problems. I am very happy with my performance although I know that I could do it faster. 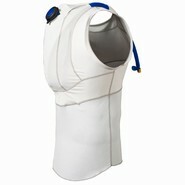 With constant training I should be able to improve my time in my next swimming events. 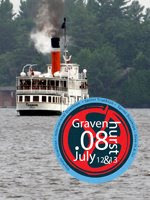 This race starts from the Muskoka Steamships. It was very tough bike ride in heavy rain, hail and lightening. Sunny and humid during the run - I didn't apply any sunscreen during cloudy pre-race preparations and I burnt myself badly. I am a casual-runner, an accidental-swimmer and a recreational-cyclist but I might be a dedicated-triathlete.